To accommodate an expected increase in attendance for Easter Sunday, there are no ABFs, IBI classes, Student Ministry, and Children’s KStation scheduled for today. Children, birth-kindergarten, have their normal Sunday schedules. First through twelfth grades should worship with their parents. Please join us in welcoming our newest members, voted into membership by the Board of Elders on Thursday, March 28, 2019: Craig & Jen Baxter, Dennis & Hui Gittens Jr., John Fite Jr., Pedro & Lissie Chevere, Paul & Melissa Kalajainen, Caleb Pipping, and Jeff & Heather Woodard. 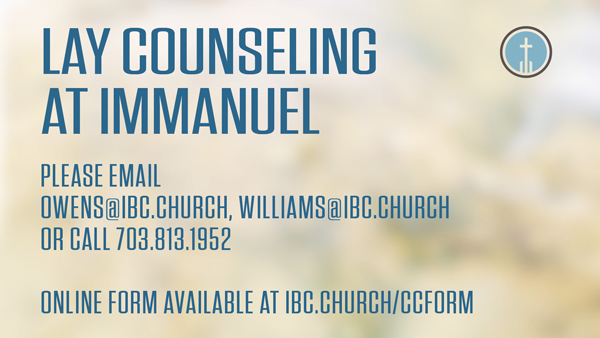 Visit ibc.church/men for more information. Calling all moms of elementary school children: Join us this month for an evening of encouragement and connection with other moms in the same season of life. Penny Wood will be speaking on Contentment. 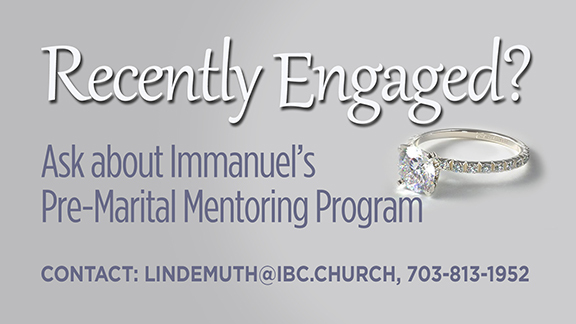 Find out more and register for EMOMS at ibc.church/emoms. Snack donations are needed for our children's classes: Goldfish, animal crackers, pretzels, Ritz, and Graham Crackers. Please bring your donations to the Resource Room. Thank you! Please refer to the printed bulletin to learn about this week's featured missionaries. The Hispanos en Cristo ministry will be holding its Annual Yard Sale on Saturday, May 11, in the IBC parking lot. We will be accepting donations every Sunday morning in the box truck parked behind the Gym (Entrance 8). Pickups may also be arranged, upon request, for large items. Please call Mario Butron, 571.213.0771, for more information or to arrange a pickup. Come listen to the Immanuel Bible Church Choir and The Prestonwood Baptist Church Choir (Dallas, TX), along with featured speakers, Governor Mike Huckabee, Dr. Jack Graham, Bishop Harry Jackson and Michael Neale. This is a free event with general admission tickets. For tickets, visit PrestonwoodinDC.com or call 615.771.2665. ICS is now accepting applications for middle school teachers (6th and 8th), middle school math teacher (part-time), Athletic Director (MS & HS), high school teachers (History and English). All teaching positions are full-time unless noted and require an education degree and classroom experience. Visit icsva.org/employment for more details and to apply. Come to our "First Look Fridays" scheduled throughout the year, 9-11am, to see ICS K-8th grade classes in action. Dates are: April 26 and May 17. 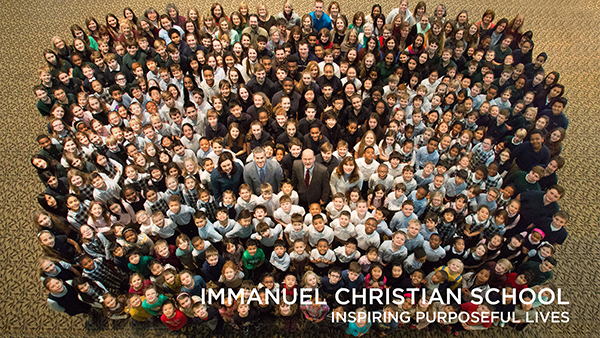 We offer guided tours, time to hear from the leadership, see classes in action and an opportunity to view curriculum. RSVP at icsva.org/admissions. The Bookstore has some wonderful books featured by our Women’s Retreat speakers on sale this week. Be sure to look on the blue cart in the hallway just outside the Bookstore and at the front of the Store. Jen Wilkin has two great titles: None Like Him - 10 Ways God Is Different From Us and In His Image- 10 Ways God Calls Us to Reflect His Character. These featured books are 20% off. Don’t forget to pick up your Easter cards too!